Free ebooks by established authors are hard to find. However, The Road to Hell is a boxed set of four of Paul Levine’s gripping short stories offered FREE for a short time on several e-publishing platforms. These stories all have the word “hell” in their titles, but they have more in common than just that. In each of them, the heroes must travel dark and dangerous paths, confronting devilish and powerful villains in their search for answers. Those journeys take place by land, by sea or simply in the mind, and will have crime fiction fans gripped from beginning to end. If you’re looking for free ebooks, look no more. When his mother dies, a 13-year-old Mexican boy bravely crosses the border and goes in search of his father, a migrant working in the United States. In a short story inspired by a tale the author heard in Mexicali, and a roadside sign he saw near the Mexican border, the boy’s courage is tested to the limit when he crosses paths with two gun-toting American vigilantes. This well-known Hollywood phrase is used to describe the purgatory in which books and screenplays get stuck while in “development”, rather than being made into films. In this short story, a bedraggled Edgar Allan Poe comes to blows with a slick Hollywood producer in a “pitch session” that shows off the author’s colorful imagination to full effect. The insecure prosecutor at the centre of A Hell of a Crime exists in the shadow of his more prominent lawyer-parents, but all is not as it seems in this dysfunctional legal family. With a father who was revered as a District Attorney, and a mother who’s a powerful trial lawyer, our prosecutor protagonist has the weight of decades of legal experience behind him. But why does his mother interfere as he prepares to prosecute in a murder trial? Mismatched Miami law partners Steve Solomon and Victoria Lord are back, in a short story that sees the ethically-challenged Solomon up to no good. Straight-laced Victoria is suspicious when Steve tells her he’s off to go fishing with sleazy con man Manuel Cruz. Knowing that Cruz embezzled a bundle from Steve’s favorite client, Victoria suspects that there’s something fishier going on than fishing. What’s Steve up to this time? Something between mischief and murder. 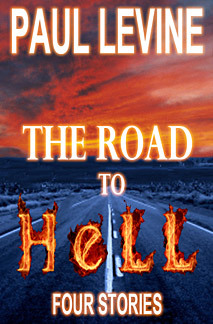 So, if you’re looking for free ebooks, The Road to Hell is a good place to start. It’s available FREE at Kindle, Barnes and Noble , and Smashwords for a limited time.